Yesterday, after the American Health Care Reform Bill was pulled for lack of support, Donald Trump made a statement from the Oval Office. From a Nonverbal Perspective perspective (as well as from a Public Relations point-of-view) there were a good number of faux pas and insightful tells in this ten-minute video. What follows are some of the highlights. 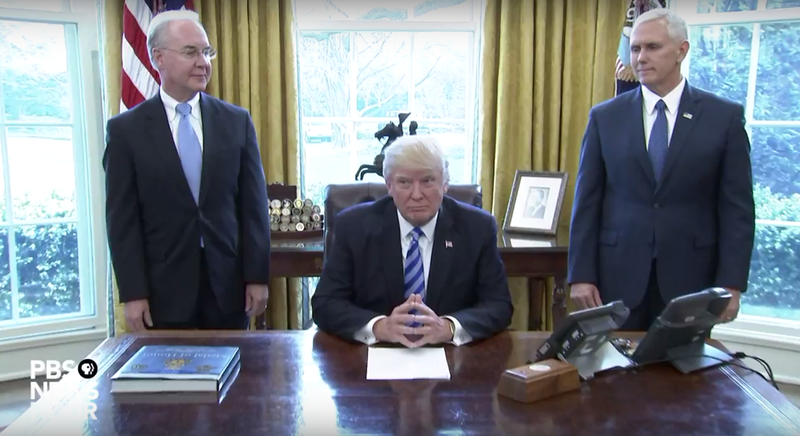 It diminishes President Trump's power and alpha status to have Mike Pence and Tom Price standing while he was sitting during his speech. 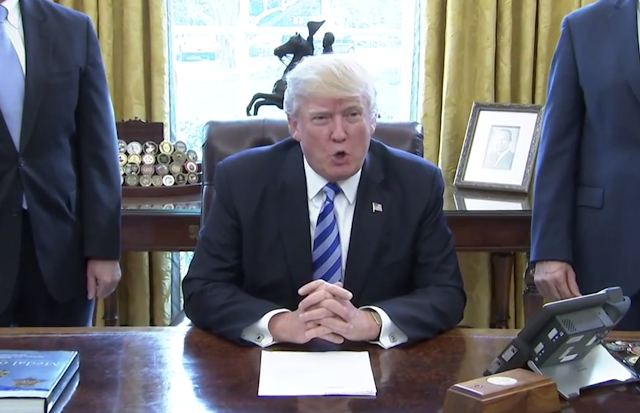 While during bill signings/signing ceremonies this "leader-sitting while subordinates are standing" posing is often seen - yet it's a completely different scenario when it's explaining a loss - and when Trump's statement comes from inside the Oval Office. This demonstrated an attempt to "spread the blame" for the Bill's failure. Additionally, it's also unusual that his Vice President was to his left. The second-in-command should be to Trump's right, whether sitting or standing. Another highly unusual component of this video was the fact that the camera was hand-held. The continual wobbling of the image is, at best, highly amateurish. This very literal visual instability projects a destructive metaphorical instability to our view of the President. The image above was Donald Trump's configuration during the first 1.0 second of the 10:03 video. After the first second, this (mid-level) "Conventional Steeple" was no longer seen. In general, Donald Trump uses the conventional steeple far too frequently - but it was not so yesterday. This deviation from his normal baseline behavior is a very strong tell that President Trump felt "very beta" after this AHCA defeat. Once he begins speaking, but only for the next 6 seconds, as he says, "Thank you very much. We were very close, and it was a very, very tight margin. We had no Democrat support....", the President intertwines his fingers - a signal of frustration. 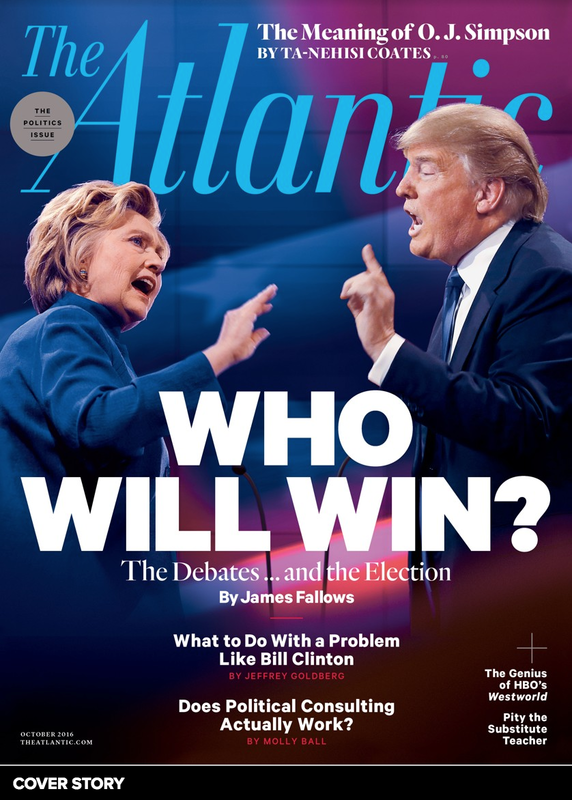 President Trump then transforms his posture with his right-hand gripping his left forearm while his left-hand closes in a fist. He also leans forward with his elbows bearing a portion of his weight on the desk. This hunches his shoulders while simultaneously foreshortening his neck. His upper arms also held very close to his torso - adding a further protective effect. 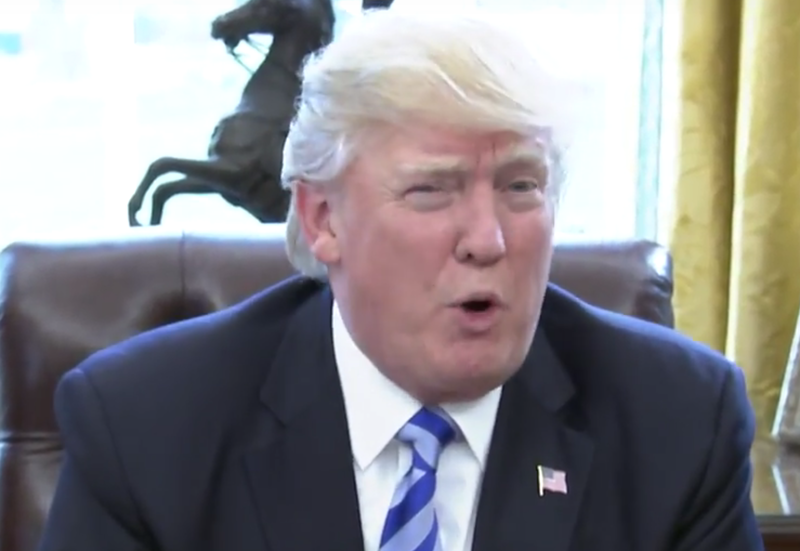 While a mild leaning forward is, much of the time, good body language posture for any speaker or leader to use - for it demonstrates engagement and assertiveness (and Donald Trump is better at most at leaning forward), all the other components of this cluster diminish his alpha status - and indeed makes him significantly beta and weak. Throughout most of this video, President Trump maintains this arm position/body language stance (although we can't see it directly for a good portion, it can be inferred by the position of his upper arms and shoulders). This is highly consistent with his - and the GOP's loss (which only just occurred) and it gives us a window into his diminished emotional comfort and lowered confidence. 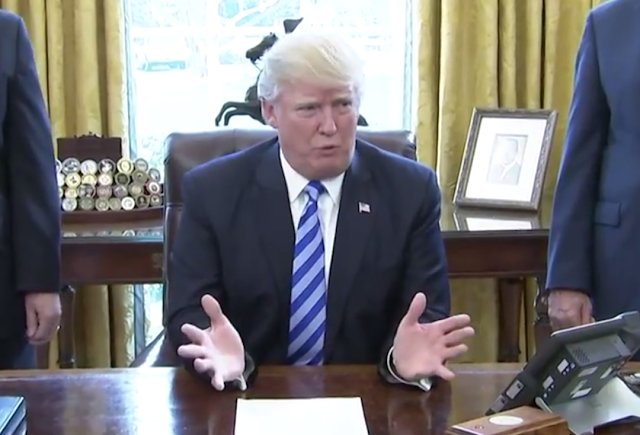 When, occasionally, he does unclasp his hand-to-forearm, Donald Trump displays this gesture (image immediately above) - where his upper arm move even very closer to his torso - while his lower arms move medially and laterally (in and out). This is also a beta gesture (illustrator). If he were to alter this, by simply keeping his upper arms further away from his torso, it would both up-regulate his emotional-mental state to a higher level - but also project this strength to anyone watching. In contrast, what we see here further betrays Trump's beta thoughts and feelings. When, at 7:39, Donald Trump is asked, "Do you feel betrayed by the House Freedom Caucus at all? They seemed to be the most difficult... (cross-talk)", his mouth corners pull laterally with his 'mustache area' tightening, and his lips thin-out. He also looks left and slightly downward (accentuated by a head-tilt). This entire cluster-configuration is indicative of regret. Trump then answers with, "No, not particularly. They're friends of mine. I'm disappointed because we could have had it. So I'm disappointed. I'm a little surprised, to be honest with you. 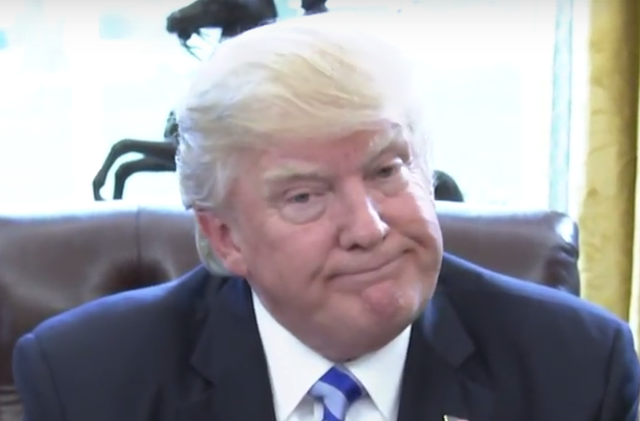 We really had it...."
Thus this significant facial expression of regret, just after the question of betrayal, strongly indicates that President Trump does sincerely feel betrayed by the House Freedom Caucus. 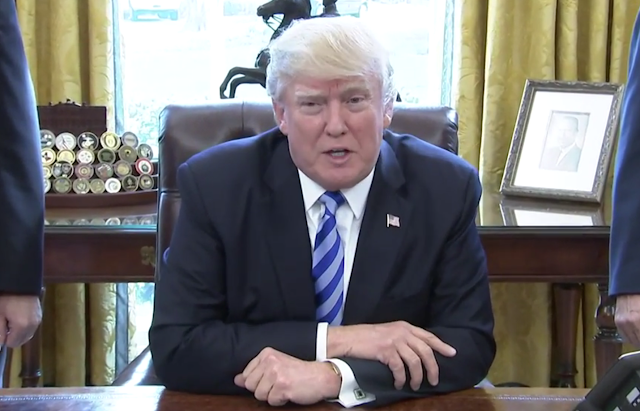 Finally, one other body language signal is seen in great abundance in the President's Oval Office statement, yet you must watch the video to see it, for it doesn't capture well with a still image. Donald Trump shrugs his shoulders 40 times in 10 minutes. This averages to 1 shrug every 15 seconds - although most of these occur in the last 60% of the video. Some of these are subtle - being muted by the President's elbows bearing a portion of his weight. 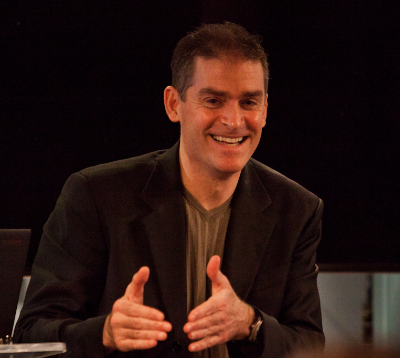 An accurate and profoundly valuable body language axiom is: If a person is shrugging with high frequency, they are either trying to convince themselves - or convince you (or both) - and they are trying too hard to do so. It's one nonverbal barometer of their attempt to rationalize and/or to co-opt others in co-rationalization. Ask yourself why - and take heed. Summary: Not surprisingly, after the GOP's AHCA Bill being pulled, Donald Trump's body language during his follow-up, ten minute Oval Office statement is significantly beta in its emotional tone - which is quite unusual for him.